Weight Watchers' stock is soaring Tuesday after the company announced that DJ Khaled would be its social-media ambassador. Scoring endorsement deals with high-profile celebrities is a strategy that has worked well for the company in the past. Oprah Winfrey's investment in and subsequent affiliation with Weight Watchers have spurred a major stock price recovery since late 2015. Weight Watchers has added another celebrity to its stable of endorsers in an attempt to replicate the success it's had with Oprah Winfrey. The plus-size star DJ Khaled will now represent the weight-loss company as a social-media ambassador, a role in which he is set to document his experience and progress on various channels, according to a company release. The decision marks the latest installment in a corporate strategy that involves tying the Weight Watcher brand to influential celebrities -- a strategy that has succeeded in lifting the company's stock from the doldrums. 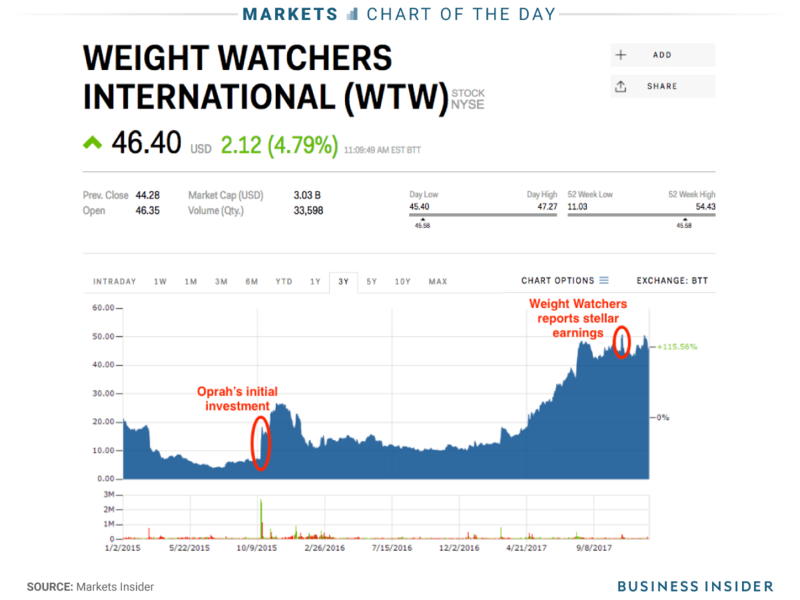 Weight Watchers, which was trading below $7 a share in October 2015, doubled in a single day on Oprah's initial announcement. Since then, the stock has exploded by more than 574%, including almost 300% in 2017. And it has been a mutually beneficial setup, with Oprah's full stake in the company reaching a value of more than $500 million along the way. Weight Watchers will be looking for DJ Khaled's branding efforts to be similarly accretive to its share price. And by the looks of investor positioning, it will have much less resistance than in the past. Short interest on Weight Watchers -- a measure of bets that a stock will drop -- declined by more than $10 million, or 59%, in 2017 as shares rallied, according to data compiled by the financial-analytics firm S3 Partners. In other words, traders are relatively unhedged, and they're not directionally bearish. And with the stock up by as much as 7% on Tuesday, the so-called Oprah effect looks alive and well with DJ Khaled as a new driving force.